I will admit it, Mangoes are something of an obsession with me. My neighbor has a huge Mango tree that has just the right kind of fruit, Hagen Mangoes. They're beyond sweet, tasty and grow as large as 2 pounds each. Unfortunately he "trimmed" the tree, which is to say he "elevated" the tree. This means that the lowest fruit is more than my own reach of 8 feet from the ground. Since it is a mature tree, the top leaves of it are at least 30 feet from the ground. This means that in order to get the fruit, I have to use a Fruit Picking Pole, another pole duct taped to it, and maybe even a ladder. It also means that there will be fruit left on the highest branches to mature to an almost melon size and weight. What grows up, must fall down, and a 2 pound fruit will do some major damage when it crashes to the ground. If you have a fruit tree, trim it like an umbrella, broad and not tall. It will make it easier for you to pick later. At any rate, what is now falling is the last fruit of the year. So I wanted to do it justice by making something out of it. I went in search for a good fruit Jam recipe and found an excellent one. This will work with anything with a "pudding" consistency so I suspect if you wanted to make a banana jelly it would work too. Of course if you want to save calories, you can reduce sugar by substituting in some Stevia or other alternate non-liquid granulated sweetener. I did in the first batch, and went all sugar in the second batch, and both were wonderful. You just couldn't tell the difference. The nice thing about it was that I was able to use this on my bread machine's Jam and Jelly setting. No effort at all. Add 1 Packet of Unsweetened SureJell Fruit Pectin. Alternately, this may be cooked on medium on the stove until the jam begins to set. 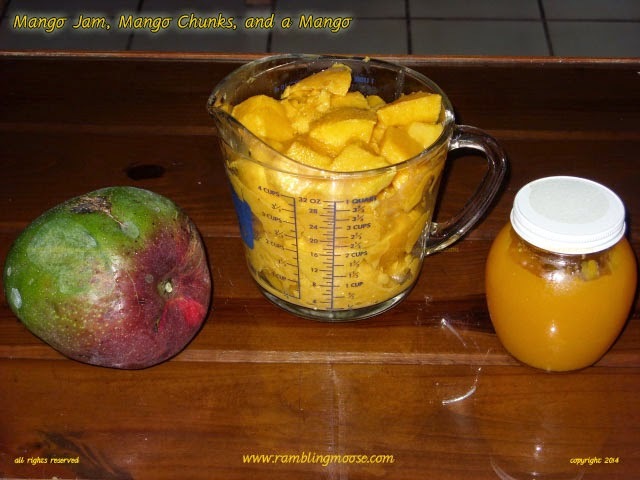 In the specific case of the second go with this recipe, I did my first ever canning without any help, so it really is a "Science Experiment" for me! The Jam was a success and tasted wonderful on French Toast or with Peanut Butter on some homemade gingery bread. You do bake your own bread don't you? If so, Pat's Pizza Dough is a great basic recipe, or just search this blog for things like Cinnamon Muffins or Cinnamon Raisin Bread. I can guarantee that all of those will work out well for French Toast since I have used them all for that once they got a little past their peak.